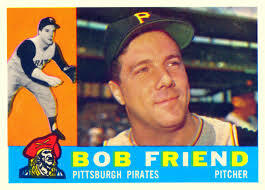 Bob Friend was one of baseball’s more consistent starting pitchers during his era and a workhorse for the 1960 Pittsburgh Pirates. That year the right-hander led the team in games started and innings pitched while posting an 18-12 record and 3.00 earned-run average in a major comeback from a disappointing 1959 campaign. Durable at 6-feet and 190 pounds, Friend — nicknamed "The Warrior"1 — never spent a single day on a disabled list in his 16-year career, in which he pitched mostly for the Pirates. At the beginning of his career, Friend’s best pitches were a sinking fastball and a hard curveball; later on, he would add a slider to his repertoire. He had unusually good control. A winner of 197 major-league games, Friend as of 2018 still held Pirates records for career innings pitched and strikeouts. From 1951 to 1965 he averaged 232 innings pitched and 13 victories for some very lackluster Bucco teams. He pitched more than 200 innings for 11 consecutive seasons (1955 through 1965). As a 24-year-old in 1955, Friend became the first pitcher to lead his league in ERA while pitching for a last-place team. He went on to pace the National League in victories once, innings pitched twice, and games started three times. Robert Bartmess Friend was born in Lafayette, Indiana, on November 24, 1930. He grew up in nearby West Lafayette, and as a young boy studied piano; his father was an orchestra leader who died when Bob was 16. At West Lafayette High School, Friend was a sports star — an all-state football halfback and an all-state pitcher, and he also played basketball and golf. It was in high school that Friend earned the “Warrior” nickname. He enrolled at Purdue in the fall of 1949, and a year later signed a professional contract with the Pittsburgh Pirates. The scout who inked him to the deal was Stan Feasal, who once worked for Pirates general manager Branch Rickey in Brooklyn. Friend’s bonus was $12,500, a decent amount in those days. The 20-year-old was invited to join the Pirates in spring training in 1950, and afterward was given a minor-league assignment. After entering Pittsburgh’s farm system in 1950, Friend posted a 12-9 record for the Waco Pirates in the Class B Big State League. Bumped up to the Indianapolis Indians of the Triple-A American Association, he finished the year with a 2-4 record. Friend told SABR researcher Gregory Wolf in a published interview that he learned about his promotion from Waco manager Al Lopez, the former major-league catcher. Despite the Pirates’ losing ways in the early 1950s, Friend admired Meyer, who had to deal with plenty of Pirate misfortunes on the field. “He was one of the good ones. He was losing his patience with the players they were bringing up. I don’t think he could go through another losing season, especially like the one in 1952 when we lost 112 games,” he said. Friend’s first season was 1951, and the 20-year-old went 6-10, not getting much run support from a dreadful Pirates team that finished seventh in the eight-team league. He posted a 4.27 ERA and switched off as a starter and a reliever in his rookie year, starting 22 games and relieving in 12. The next few years were more of the same — a young Friend learned the ropes of pitching on lackluster teams. In 1952 he posted a 7-17 record with a 4.18 ERA; in 1953 he went 8-11 with a 4.90 ERA, and then in 1954 he won seven and lost 12 while putting up a 5.07 ERA. All those Pirate teams finished dead last. It helped greatly — his breakout season came in 1955. Friend’s 2.83 ERA was the best in the National League. His 14-9 record was more indicative of the Pirates’ last-place finish and league-worst offense. For the first time — of which there would be many — Friend reached 200 innings pitched. He also struck out 98 batters in 44 games (20 starts), as he continued to alternate between starting and the bullpen. By now Friend had established himself as Pittsburgh’s best pitcher (there was not much competition). Teammate Vern Law was the second best hurler on the team at that point. In 1955 no Cy Young Award was given out (it began in 1956), but arguably Friend might have won it. Friend followed up his 1955 season with another solid one in 1956, where some — not all — of his statistics would improve. Named to the All-Star team for the first time, he went 17-17 with a 3.46 ERA and 166 strikeouts, 68 more than the year before. He pitched an amazing total of 314 innings (league leader) and started 42 games (league leader and the most since Pete Alexander in 1917) in 49 appearances. He had 19 complete games and hurled four shutouts. Meanwhile, the Pirates inched up to a seventh-place finish. The next season, 1957, Friend, clearly a workhouse on the mound, became a starter exclusively, and he continued to improve. His ERA dipped to 3.38 as he notched a major-league-leading 277 innings. His record was 14-18. The Bucs finished seventh again, tied with the Chicago Cubs. Finally, in 1958, both Friend and the Pirates put together mutually strong seasons. Pittsburgh slightly ramped up its offense to finish second in the league while Friend won a career-high 22 games (14 losses) with a 3.68 ERA. He won a trip to the All-Star Game, and once again led the league in starts (38) while throwing a hefty 274 innings. His 22 wins were good for a tie for first in the league with Warren Spahn. He made his second All-Star Game and came his closest to winning the Cy Young Award (third place). Asked what he considered his two biggest career highlights, Friend responded that his 22 wins in 1958 and his durability — perhaps above all — stood out in his mind. Looking ahead, both Friend and the Pirates seemed poised for glory. A determined Friend re-earned his “Warrior” moniker and got into terrific shape that offseason. Though he lost 4-3 on Opening Day (April 12) to the Milwaukee Braves, he rebounded to pitch three complete-game victories in a row. By the end of May, he sported a 2.33 ERA and 5-2 record. In June Friend notched four more victories while keeping his ERA at 2.91. He hurled a complete-game shutout on June 22 against the Cardinals. Named to the All-Star team for the third time, Friend wobbled a bit in July, going 3-4 en route to a 3.03 ERA and 11-7 record by that point in the season. One big victory came July 25 when he prevailed over St. Louis to put the Pirates in first place for good. He lowered the ERA to 2.95 by the end of August while gaining his 14th victory against 11 losses. He exhibited his best pitching in the all-important September stretch drive, tossing three complete games and winning four of five decisions while the front-running Bucs won his only no-decision start in that span. With the Pirates headed to the World Series, Friend finished 1960 with an 18-12 record and a 3.00 ERA. He was named the UPI’s Comeback Player of the Year, and was second in the league in games started (37) and innings pitched (275 2/3), fourth in complete games (16) and fifth in strikeouts with 183, which was a club record. Always an excellent control pitcher, he topped the National League in strikeout-to-walk ratio at 4.07. In the fall classic the Pirates would be facing a powerful New York Yankee team highlighted by Mickey Mantle, Roger Maris, Whitey Ford, and Yogi Berra. That season they had won 97 games — only two more, however, than the underdog Pirates. As has been well chronicled, the insurgent Pirates won one of the most dramatic World Series ever with Bill Mazeroski’s Game Seven home run — plus a whole lot of other help from different players in that 10-9 victory. But Friend’s performance in the Series was not up to the benchmark he had established during the season. Simply, he got rocked. He started Game Two and was chased after four innings (though he gave up only two earned runs) as the Yankees pummeled Pittsburgh, 16-3. In his next start, Game Six, Friend caught the brunt of the Yankee attack, surviving only two innings while coughing up five runs in a 12-0 shutout of Pittsburgh. With the Series tied at three apiece, all Bucco hands were on deck for Game Seven; Friend was called in to pitch the ninth inning, but he could not stop the Yankee offense then, either, giving up two runs and not even securing an out. It sounds as if Murtaugh knew that Friend had been taxed with a heavy pitching load in September in which he had given his total effort — he started six games and threw 38 innings on top of an August when he hurled 56 innings. Arguably, there was probably not much left in his arm come October. And the Yanks were just darn good hitters, of course. To Pittsburgh fans, it did not matter—they were champions! The city went wild after the final game at Forbes Field, which gave the Pirates their first World Series title since 1925. The Pirates never did reach those heights again while Friend played for them — the best they would do was third place in 1965, his last season with the organization. In the afterglow of that magical World Series win, he compiled a respectable 3.85 ERA in 1961, but led the league in losses with 19 while winning 14. He hurled 236 innings, the seventh consecutive season he had more than 200. The next season, 1962, he led the league with five shutouts while crafting an 18-14 record and a 3.06 ERA. Friend tallied one of his best seasons in 1963 when he recorded a career-low ERA of 2.34 en route to winning 17 games (he lost 16). In walking just 44 batters, he topped the league in fewest bases on balls per nine innings (1.5). But Forbes Field no longer was Friend’s home come the winter of 1965-66. The Pirates traded him to the Yankees for reliever Pete Mikkelsen. In his last season in professional baseball, Friend went 6-12 with a 4.55 ERA. During the season, the Mets purchased Friend for cash, and he played his final game with New York’s National League team on September 24, 1966. Afterward, the 35-year-old Friend retired from baseball. Bob Friend finished his 16-year career with a 197-230 record, a 3.58 ERA, 1,734 career strikeouts, and 3,611 innings pitched. He pitched 36 shutouts in 163 complete games. In 602 games, he gave up 1,438 earned runs. Friend remains as of 2012 the only pitcher to lose more than 200 while winning fewer than 200, mostly due to playing with five last-place Pirate teams. On the sabermetric front, he had a career Wins-Above-Replacement total of 42.1. As a batter, Friend hit .121 with two home runs and 60 RBIs, three coming on May 2, 1954, in an 18-10 win over the Chicago Cubs. Off the field, Friend in 1957 married Patricia Koval, a nurse in the office of the Pirates’ team doctor. They had two children — one of them, Bob Jr., turned out to be a highly successful professional golfer on the PGA Tour. Re-elected as controller in 1971, Friend went on to serve as a three-time delegate to the Republican National Convention, but did not run for higher office beyond controller. On the philanthropy front, he led a popular annual fundraising drive for Children’s Hospital in Pittsburgh in the 1980s. Friend retired from his post-baseball business and political career in 2005 and lived in O’Hara Township, northeast of downtown Pittsburgh, until his death at the age of 88 on February 3, 2019. Bob Friend, “The Warrior,” is considered one of the Pirates’ most historically significant pitchers of all time. An earlier version of this biography is included in the book "Sweet '60: The 1960 Pittsburgh Pirates" (SABR, 2013), edited by Clifton Blue Parker and Bill Nowlin. 1 Rick Cushing, 1960 Pittsburgh Pirates: Day by Day: A Special Season, An Extraordinary World Series (Pittsburgh: Dorrance Publishing, 2010), 363. 2 Clifton B. Parker interview of Bob Friend, November 17, 2012. 15 Baseball-reference.com entry at http://www.baseball-reference.com/bullpen/Bob_Friend. 19 Associated Press article in the Miami News, “Pirate Victory Like Pep K.O. Over Rocky,” October 16, 1960. 23 Bob Friend Wikipedia entry. 27 Bill Syken, “Bob Friend, Pitcher,” Sports Illustrated, August 9, 2004. 28 Associated Press story in the Daytona Beach (Florida) Morning Journal, “Bob Friend Elected on the First Try,” November 9, 1967. 31 “Ex-Pirate Pitcher Proves He’s Hospital’s Best Friend,” Pittsburgh Press, November 17, 1981.